Wellpark Brewery’s bespoke hospitality training facility, the Tennent’s Training Academy, has partnered up with Hospitality Industry Trust (HIT) Scotland to offer nine lucky students free scholarship programmes to learn the tricks of the trade. The first-time scholarship programme kicked off this week (30th April) and is seeing the emerging talent of Scotland’s trade industry delve into hands-on masterclasses worth over £10,000 with a team of industry experts in Whisky, Wine, Cocktails and Beer. The lucky nine, handpicked by HIT Scotland, will spend the week learning from the best, with cocktail flair training with six times Scottish Champion David Monaghan and heading behind closed doors of the brewery itself to learn about the brewing production process. 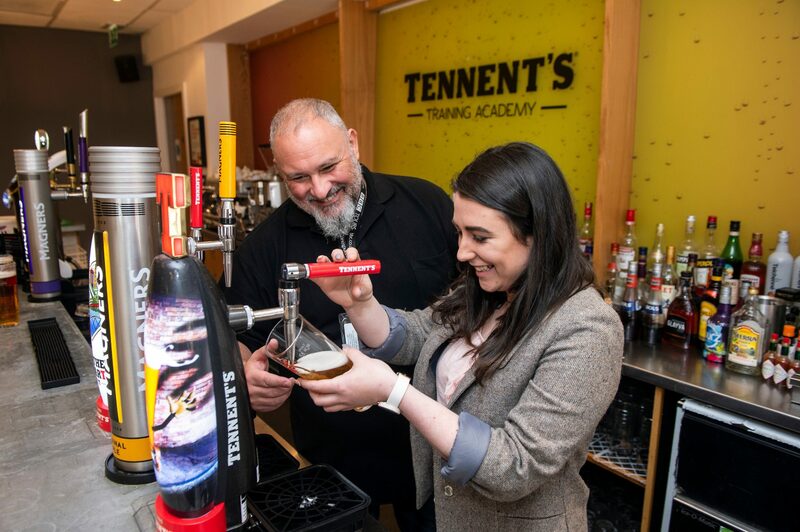 Laura Hepburn, Training and Events Manager at Tennent’s Training Academy, said: “One of Tennent’s core values is to give back to the Scottish hospitality industry and we’re happy to be able to facilitate this at the TTA in partnership with HIT Scotland for the first time. David Cochrane, HIT Scotland Chief Executive said: “The Tennent’s Training Academy scholarship is a fantastic addition to the HIT Scotland scholarship programme. This new five-day course gives our scholars professional training from industry experts, in a fantastic setting, and allows them to take their skills to the next level. HIT Scotland’s scholarships vary from skills courses to unique experiences, in areas including management, revenue, sales, social media, customer experience, green tourism, food and drink. Places are open to anyone studying or working in the hospitality industry in Scotland who wants to improve their skills and knowledge. For more information on Tennent’s Training Academy courses, visit www.tennentstrainingacademy.co.uk.